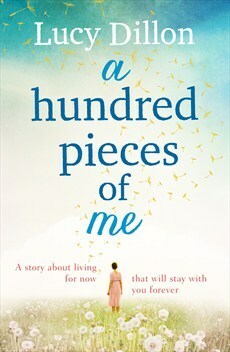 A Hundred Pieces of Me is a book that you hope won’t ever come to an end because it’s a delight to read. However, when you do reach the final word you begin reflecting back on what you’ve just read. It’s not only a wonderful story, but it forces you to reflect on your own life and what choices you’d make if you could only keep one hundred items. Ms. Dillon pulls you into the story immediately and you connect with Gina as she begins her journey to rebuild her life. The author also does a wonderful job playing on all your emotions. I think there’s a little bit of Gina in all of us, and that’s what makes you read on. The dialogue is very natural sounding and despite the book’s 500 plus pages, time flies by as you read more. In fact, you want to read just a little more at each setting to see what Gina selects as her hundred pieces and what background and story is connected with it. What I also liked about this book was the backstory unfolded slowly and intermingled with each chapter about the hundred pieces. I felt it gave more insight into Gina’s character and why she was choosing a particular item. One of the endorsements on the back of the book mentioned that it’s a book that you want to read one more chapter before you turn in for the night and that’s exactly what happened to me. This is the first book I’ve read by Lucy Dillion, but it definitely won’t be the last. With summer reading season ahead, I’d highly recommend you add this book to your list.